trash: Install 1 card, paying all costs. Use this ability only during the next paid ability window after playing and resolving an operation. "They don't need sleep, breaks, overtime, or even O₂. How can we compete with that!?" What does “immediately after playing an operation” on Bioroid Work Crew mean? Does the Corp trigger this ability in the next paid ability window after resolving an operation, or does it have special timing? Does Bioroid Work Crew need to be rezzed when the Corp plays the operation, or can they rez and use it in the same window? Bioroid Work Crew does not need to be rezzed when the operation is played or resolved. The Corp can rez Bioroid Work Crew, or even use any other paid ability window effects, before using Bioroid Work Crew, as long as this all occurs during the first paid ability window that opens immediately following the resolution of the operation. Can the Corp use more than one Bioroid Work Crew in the same paid ability window after playing an operation? Can the Corp use Bioroid Work Crew after playing a terminal operation? Yes. Although the paid ability window that normally immediately follows each action is skipped by terminal operations, the paid ability window during the Corp’s discard phase is the “next” paid ability window that opens after having played and resolved the operation in question. 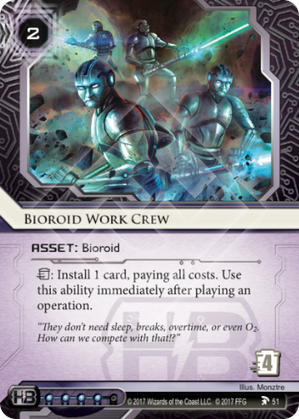 Can the Corp use Bioroid Work Crew after playing an operation through a card ability, such as Bryan Stinson? Then if you have Team Sponsorship you can get it right back! If not, Friends in High Places will do just fine. This is another 4 trash cost must-trash asset for HB asset spam. High influence cost will mean this is likely not going to see play outside of HB. HB asset spam is probably going to be one of the strongest archetypes for the foreseeable future.